Barium titanate (BaTiO3 or BTO) is currently one of the most promising ferroelectric materials for enabling Pockels modulation that is compatible with silicon photonic circuits. The relative permittivity of BTO has been characterized in thin films deposited on a silicon-on-insulator (SOI) substrate. High values between 800 and 1600 have been estimated at 20 GHz. Furthermore, no substantial difference has been obtained by using BTO grown by molecular beam epitaxy and sputtering. The obtained permittivity has been used to properly design the RF electrodes for high-speed modulation in hybrid BTO/Si devices. Electrodes have been fabricated and the possibility of achieving modulation bandwidths up to 40 GHz has been demonstrated. The bandwidth is limited by the microwave propagation losses and, in this case, different losses have been measured depending on the BTO growth process. M. E. Lines and A. M. Glass, Principles and Applications of Ferroelectrics and Related Materials (Oxford University Press, 2001). D. Hennings, “Barium titanate based ceramic materials for dielectric use,” Int. J. High Technol. Ceram. 3, 91–111 (1987). L. Sengupta and S. Sengupta, “Novel ferroelectric materials for phased array antennas,” IEEE Trans. Ultrason. Ferroelectr. Freq. Control 44, 792–797 (1997). F. De Flaviis, N. G. Alexopoulos, and O. M. Stafsudd, “Planar microwave integrated phase-shifter design with high purity ferroelectric material,” IEEE Trans. Microw. Theory Tech. 45, 963–969 (1997). 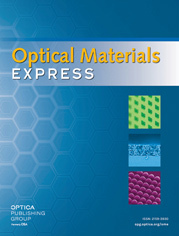 M. Zgonik, P. Bernasconi, M. Duelli, R. Schlesser, P. Günter, M. H. Garrett, D. Rytz, Y. Zhu, and X. Wu, “Dielectric, elastic, piezoelectric, electro-optic, and elasto-optic tensors of BaTiO3 crystals,” Phys. Rev. B Condens. Matter 50(9), 5941–5949 (1994). G. T. Reed, G. Mashanovich, F. Y. Gardes, and D. J. Thomson, “Silicon optical modulators,” Nat. Photonics 4, 518–526 (2010). A. Petraru, J. Schubert, M. Schmid, and C. Buchal, “Ferroelectric BaTiO3 thin-film optical waveguide modulators,” Appl. Phys. Lett. 81, 1375–1377 (2002). P. Tang, D. Towner, T. Hamano, A. Meier, and B. Wessels, “Electrooptic modulation up to 40 GHz in a barium titanate thin film waveguide modulator,” Opt. Express 12(24), 5962–5967 (2004). P. Tang, A. L. Meier, D. J. Towner, and B. W. Wessels, “BaTiO3 thin-film waveguide modulator with a low voltage-length product at near-infrared wavelengths of 0.98 and 1.55 µm,” Opt. Lett. 30(3), 254–256 (2005). M. J. Dicken, L. A. Sweatlock, D. Pacifici, H. J. Lezec, K. Bhattacharya, and H. A. Atwater, “Electrooptic modulation in thin film barium titanate plasmonic interferometers,” Nano Lett. 8(11), 4048–4052 (2008). P. Girouard, Z. Liu, P. Chen, Y. K. Jeong, Y. Tu, S.-T. Ho, and B. W. Wessels, “Enhancement of the pockels effect in photonic crystal modulators through slow light,” Opt. Lett. 41(23), 5531–5534 (2016). S. Abel, T. Stöferle, C. Marchiori, C. Rossel, M. D. Rossell, R. Erni, D. Caimi, M. Sousa, A. Chelnokov, B. J. Offrein, and J. Fompeyrine, “A strong electro-optically active lead-free ferroelectric integrated on silicon,” Nat. Commun. 4, 1671 (2013). C. Xiong, W. H. P. Pernice, J. H. Ngai, J. W. Reiner, D. Kumah, F. J. Walker, C. H. Ahn, and H. X. Tang, “Active silicon integrated nanophotonics: ferroelectric BaTiO3 devices,” Nano Lett. 14(3), 1419–1425 (2014). S. Abel, T. Stöferle, C. Marchiori, D. Caimi, L. Czornomaz, M. Stuckelberger, M. Sousa, B. J. Offrein, and J. Fompeyrine, “A hybrid barium titanate-silicon photonics platform for ultra efficient electro-optic tuning,” J. Lightwave Technol. 34, 1688–1693 (2016). F. Eltes, D. Caimi, F. Fallegger, M. Sousa, E. O’Connor, M. D. Rossell, B. Offrein, J. Fompeyrine, and S. Abel, “Low-Loss BaTiO3-Si Waveguides for Nonlinear Integrated Photonics,” ACS Photonics 3, 1698–1703 (2016). M.-H. M. Hsu, A. Marinelli, C. Merckling, M. Pantouvaki, J. Van Campenhout, P. Absil, and D. Van Thourhout, “Orientation-dependent electro-optical response of BaTiO3 on SrTiO3-buffered Si(001) studied via spectroscopic ellipsometry,” Opt. Mater. Express 7, 2030 (2017). P. Rabiei, J. Ma, S. Khan, J. Chiles, and S. Fathpour, “Heterogeneous lithium niobate photonics on silicon substrates,” Opt. Express 21(21), 25573–25581 (2013). W. H. P. Pernice, C. Xiong, F. J. Walker, and H. X. Tang, “Design of a silicon integrated electro-optic modulator using ferroelectric BaTiO3 Films,” IEEE Photonics Technol. Lett. 26, 1344–1347 (2014). X. Hu, S. Cueff, P. R. Romeo, and R. Orobtchouk, “Modeling the anisotropic electro-optic interaction in hybrid silicon-ferroelectric optical modulator,” Opt. Express 23(2), 1699–1714 (2015). P. Castera, D. Tulli, A. M. Gutierrez, and P. Sanchis, “Influence of BaTiO3 ferroelectric orientation for electro-optic modulation on silicon,” Opt. Express 23(12), 15332–15342 (2015). P. Castera, A. M. Gutierrez, D. Tulli, S. Cueff, R. Orobtchouk, P. R. Romeo, G. Saint-Girons, and P. Sanchis, “Electro-Optical Modulation Based on Pockels Effect in BaTiO3 with a Multi-Domain Structure,” IEEE Photonics Technol. Lett. 28, 990–993 (2016). C. A. T. Siciunas and E. Salama, “Characteristics of RF Sputtered Barium Titanate Films on Silicon,” J. Vac. Sci. Technol. 9, 91 (1972). T. Hayashi, N. Oji, and H. Maiwa, “Film thickness dependence of dielectric properties of BaTiO3 thin films prepared by sol-gel method,” Jpn. J. Appl. Phys. 33, 5277–5280 (1994). T. Hamano, D. J. Towner, and B. W. Wessels, “Relative dielectric constant of epitaxial BaTiO3 thin films in the GHz frequency range,” Appl. Phys. Lett. 83, 5274–5276 (2003). R. A. McKee, F. J. Walker, J. R. Conner, E. D. Specht, and D. E. Zelmon, “Molecular beam epitaxy growth of epitaxial barium silicide, barium oxide, and barium titanate on silicon,” Appl. Phys. Lett. 59, 782–784 (1991). K. Schraml and D. Heberling, “Estimation of the propagation constant in multilayer microwave circuits using a low cost multiline system,” in 2015 Loughborough Antennas and Propagation Conference, LAPC 2015, 1–4 (2015). M. D. Janezic and J. a. Jargon, “Complex permittivity determination from propagation constant measurements,” IEEE Microw. Guided Wave Lett. 9, 76–78 (1999). G. F. Engen and C. A. Hoer, “Thru-Reflect-Line: An Improved Technique for Calibrating the Dual Six-Port Automatic Network Analyzer,” IEEE Trans. Microw. Theory Tech. 27, 987–993 (1979). K. Wu and L. Li, “Numerical calibration and de-embedding techniques for CAD and equivalent circuit models of electromagnetic structures,” Microw. Rev. June, 7–19 (2005). R. O. D. C. Alferness, “Waveguide Electrooptic Modulators,” IEEE Trans. Microw. Theory Tech. 30, 1121–1137 (1982). D. M. Pozar, Microwave engineering (Addison-Wesley Publ. Co., 1993). H. Chung, W. S. C. Chang, and E. L. Adler, “Modeling and Optimization of Traveling-Wave LiNbO3 Interferometric Modulators,” IEEE J. Quantum Electron. 27, 608–617 (1991). Alferness, R. O. D. C.
Fig. 1 RF coplanar waveguide structure used to characterize the BTO permittivity. Fig. 2 Fabricated CPWs with lengths between 1 mm and 3 mm. Fig. 3 (a) Schematic of the measurement set-up by using a vector network analyzer (VNA) and photo zoom in the device under test (DUT) area, and (b) measured effective permittivity as a function of the RF frequency for the samples with BTO fabricated by MBE and RF sputtering. Fig. 4 (a) Simulated electric field distribution of the quasi-TEM mode at the frequency of 20 GHz. The inset shows with more detail the CPW structure, and (b) simulated effective permittivity of the CPW as a function of the BTO relative permittivity and measured values extracted at 20 GHz from the different delay lines fabricated in the samples with BTO grown by MBE and RF sputtering. Fig. 5 (a) Hybrid BTO/Si optical waveguide with coplanar strip-line electrodes and (b) simulated impedance of the CPS electrode and microwave index of the RF mode at 20 GHz as a function of the gap and for an electrodes width of 2 µm, (c) optical mode profile for TE and (d) TM polarizations. Fig. 6 Simulated and experimental (a) impedance and (b) microwave propagation losses of the designed CPS electrode as a function of the RF frequency. Only conductor losses are included in the simulations. Fig. 7 Simulated electro-optical modulation response for a modulation length of 1.5 mm, TM polarization and taking into account the simulated and measured microwave losses.